Justice Department Charges Chinese Hackers In Bid To Curtail Cyber-Theft The two men are accused of being part of a vast government effort to transfer American trade, technology and defense secrets into Chinese hands, but are unlikely to face trial. 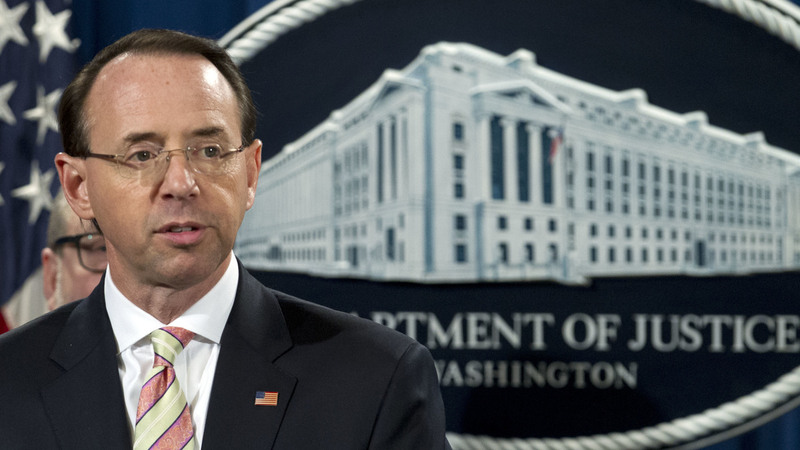 Deputy Attorney General Rod Rosenstein was among those at the Justice Department who announced charges against Chinese cyber-attackers on Thursday. It could escalate tensions between the great powers. The Justice Department announced charges Thursday against two alleged hackers suspected of working on the orders of the Chinese government as part what the U.S. alleges is a long-running effort to steal American intellectual property. The charges were part of a broader move by the Trump administration to push back against what U.S. officials describe as China's relentless drive to steal American business secrets. The two men, Zhu Hua and Zhang Shilong, are part of a "hacking group" known as Advanced Persistent Threat 10, according to an indictment unsealed in the Southern District of New York. The two men allegedly were working for a company called Huaying Haitai and in association with China's main intelligence agency, the Ministry of State Security. The men are charged with conspiracy to commit computer intrusions, conspiracy to commit wire fraud and aggravated identity theft. The indictment details alleged cyber-attacks that targeted intellectual property, confidential business and technological information and other data at more than 45 companies in at least a dozen U.S. states and within U.S. government agencies. The scale of the alleged cyber-theft is huge, from the banking and finance world to medical equipment to oil and gas exploration to aviation and space to the maritime industry. "We want China to cease its illegal cyber activities," said Deputy Attorney General Rod Rosenstein in announcing the charges. He urged Beijing to abide by international commitments it has made not to use cyber-attacks to steal secrets. And the United States isn't the only country harmed, Rosenstein said; a dozen countries were hurt by the cyber-theft detailed in the charges unveiled on Thursday. "America and its many allies know what China is doing," Rosenstein said. "We know why they're doing it. And in some cases, we even know exactly who is sitting at the keyboard perpetrating these crimes in association with the Chinese government." Rosenstein added that more than 90 percent of the Justice Department's economic espionage cases in the past seven years involve China. And he said that many of the companies that have allegedly been targeted by Chinese defendants operate in sectors that the official Chinese government policy called "Made In China 2025" listed as targets for strategic development. FBI Director Christopher Wray also emphasized the scope and scale of China's state-sponsored theft, saying individuals acting at Beijing's behest are "the most active perpetrators of economic espionage." "While we welcome fair competition, we cannot and will not tolerate illegal hacking, stealing or cheating," Wray said. The attacks described in the indictment exploited "managed service providers," described as companies that manage IT systems for clients around the world, including governments and businesses. Compromising those MSPs, the Justice Department leaders said, was like a thief getting access to the master key to an apartment building. The thief not only could access the building, but all the rooms within it, to take what he wished. The U.S. actions could add to already tense relations between Washington and Beijing. The two countries, which boast the No. 1 and No. 2 economies in the world, are in the midst of a bruising trade dispute that has seen both sides slap tariffs on the other. Justice Department officials said the timing of the indictment was not influenced by any political considerations. But it may not be viewed that way in Beijing. The announcement also followed the arrest in Canada of Meng Wanzhou, the chief financial officer of Huawei, one of China's biggest companies and one of the largest cell phone producers in the world. Canadian authorities arrested Meng at the request of the United States, which alleges she conspired to defraud several banks as part of a scheme to avoid U.S. sanctions on Iran. The case has added yet another irritant to ties between the U.S. and China.